Though the original replica produced by Factory Entertainment has sold out they are bringing an exclusive 30-inch hand-forged blade to San Diego Comic Con '18. Made from stainless steel and features Amazonian runic script on the fuller, as seen on the actual sword. The high-quality gold colored metal alloy hilt captures mirrored dragons biting into the blade with reptilian armor wrapping around the handle, ultimately resulting in the end of their tails creating a ridged pommel. 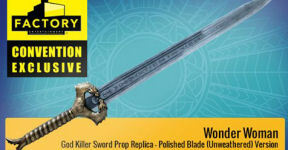 While the screen-used prop and the original, first replica made by Factory featured an extensively weathered blade, this new variant exclusive features a polished blade, suggesting the look that the God Killer would have had when newly forged. Because this is a real weapon replica you won’t actually be able to pick it up inside the convention center. Your options are to pre-order it online or order it at the Factory Entertainment booth (Booth #2647) and have it shipped to your postal address (lower 48 contiguous United States only). This amazing replica is limited to 50 pieces and can be pre-ordered now for $299.99.